I recently stumbled across a piece of music for the piano that confused me a little. The first image is how I found the score, the second is how I rearranged it myself. How I usually find pieces, is that the right hand takes the treble clef, and the left hand the bass clef. If this is the case then the top example would be very unpractical, but perhaps it is grouped by how the notes harmonically fit? Personally I find it more comfortable when reading it like the bottom example. But there could be a good reason for the arrangement of the notes like above. Is there a rule how to write/divide the notes between the clefs? Or are there guidelines for how this is usually written? And why is it done that way? In piano, the staffs usually signifies what hand plays what note where the lower staff would be your left hand and the upper staff would be your right hand. While the clefs are important, you may see the same two clefs on a grand staff. In Imagine you can see there are two bass clefs because the piano part is low. It is kind of an unwritten rule of thumb in piano and I can see some people who don't play piano notating it that way thinking it fits better in the staff. Without seeing more of the piece it could make sense that the G in the treble clef is alone because the next measure has notes in the treble clef that are higher and would make it easier to play. That being said if it is easier to play it with your right hand do it. Just because it is notated in the bass clef does not mean it was the intent of whoever wrote it to be played in the left hand. Do what feels comfortable. Notes are distributed across staves to indicate groupings. Usually this grouping is mechanical (between hands), but sometimes it's purely musical. 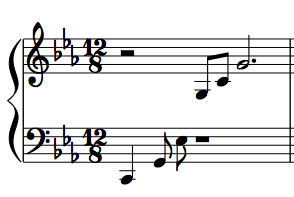 For example, Franz Liszt's solo piano pieces sometimes use three or even four staves instead of two, to better show individual "orchestral" voices. Yes, four staves for just two hands. 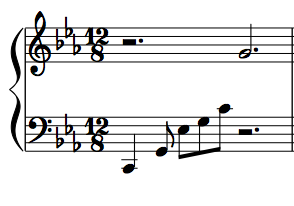 Another example: Mozart's solo piano works often have passages where the left hand noodles along, while the right plays snippets that alternate above and below the left. Were that notated strictly one staff per hand, the right hand's staff would need a zillion clef changes and become unreadable. Instead, the right-below-left snippets are drawn in the left hand's staff. In such cases, the editor may explicitly mark which hand plays something, with L.H. or R.H., or more traditionally, m.s. or m.d. An anti-example: Scriabin, Ravel and others wrote well-known music for piano left hand alone, but these are written on two staves rather than one. Finally, beaming (even cross-staff beaming) is another way to group notes together, again for either hands or for music (voices, phrase breaks). Not the answer you're looking for? Browse other questions tagged piano notation sheet-music sight-reading clefs or ask your own question. Is there piano notation for finger sustained notes (as opposed to pedal sustain)?